In Gruen's debut novel Water for Elephants, readers fell in love with the titular elephant Rosie. 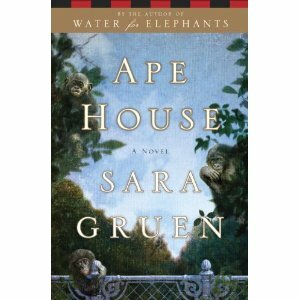 In her second novel Ape House, a similar fondness occurs with the aforementioned apes. The cast of bonobos live happily in their Language Lab under the watchful eye of scientist Isabel Duncan. They are able to use sign language to communicate and enjoy playing around with visitors and the other scientists. Everything is going great until the lab gets bombed and the apes mysteriously disappear. Once the dust settles, Duncan is horrified to find out that the bonobos have been sold to a television producer who has casted them in their own 24 hour reality tv show. Joining forces with a newspaper reporter, an exotic dancer, animal activists and other research assistants, Duncan takes on the fight of her life to rescue her bonobos and give them the proper kind of life they deserve.